Standing on a scale is a problem for physically disabled or older people. Chair scales are of great assistance to patients and medical staff in nursing homes, hospitals, geriatric and orthopedic departments. 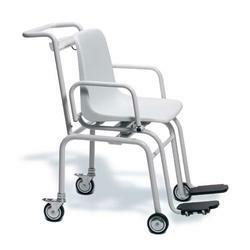 The new seca 952 offers a sound, user-oriented solution with all the functions that a good chair scale should offer. The simple solution for disabled people. Fold-up armrests and footrests make sitting down easy. Brakes on wheels for secure stance. Intuitive operating elements simplify use. All essential functions for maximum usage.